GRAND RAPIDS, Mich. (Nov. 9, 2017) – Big time Hollywood adventure will benefit Michigan’s smallest patients as Jumanji: Welcome to the Jungle has a simultaneous statewide premiere at Grand Rapid’s Celebration! Cinema North and Ann Arbor’s Michigan Theater on Tuesday, Dec. 19, in support of Jo Elyn Nyman Anchors Programs for Children at Hospice of Michigan (HOM). Tickets for the Grand Rapids fundraiser are $100 per person, including popcorn for the 7:30 p.m. showing, preceded by a brief program emceed by WZZM’s Jennifer Pascua. Admission also includes a post-movie dessert reception at the theater. Tickets are available online at www.Jumanji4Anchors.org. Anchors Programs for Children offers a full continuum of pediatric services to support families facing the life-limiting illness. As the only statewide pediatric hospice and pre-hospice program, Anchors serves families with specially trained staff that provide medical, social, spiritual and emotional support to help navigate complex medical situations. Since the inception of the pediatric programs, Anchors has served thousands of children and families across Michigan. 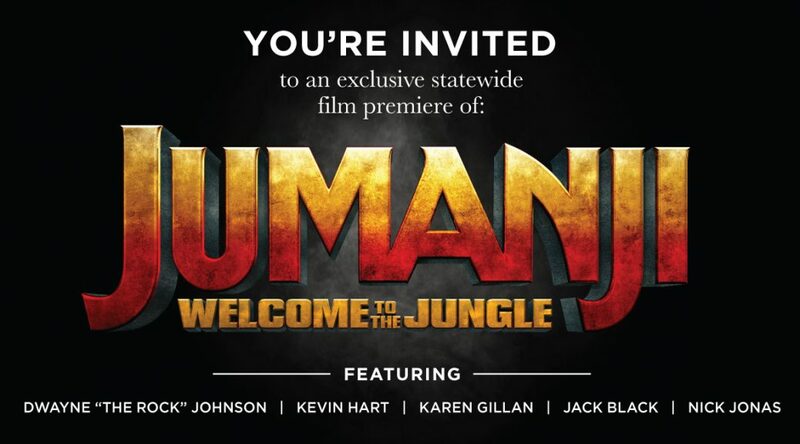 The statewide Jumanji premiere is made possible through the longtime friendship the organizations enjoy with world-renowned children’s author and illustrator Chris Van Allsburg, who penned Jumanji, and more than a dozen other books. Jumanji: Welcome to the Jungle is a brand new adventure adapted from the Caldecott author’s original 1981 book. Directed by Michigan native Jake Kasdan, the movie features Dwayne “The Rock” Johnson, Jack Black, Kevin Hart, Nick Jonas and Karen Gillan. Grand Rapids native Chris Van Allsburg and his wife, Lisa, will attend the premiere as guests of honor. Also supporting the dual-city fundraiser are statewide honorary committee members Mitch Albom and Janine Sabino, Karl and Patti Betz, Lloyd and Laurie Carr, George and Jo Elyn Nyman and Mark Schlissel and Monica Schwebs. The Grand Rapids program emceed by Pascua will be simulcast in Ann Arbor, where Detroit media veteran Chuck Gaidica, executive director of Hilltop Church in Northville, will be hosting from the Michigan Theater. The Jumanji screening follows the highly successful Michigan movie premieres of The Polar Express in 2004 and Zathura in 2005, both based on Van Allsburg books, which raised more than $1.5 million for end-of-life pediatric care. Supporting the dual-city fundraiser are statewide steering committee members James B. Fahner, MD and Kenneth Pituch, MD medical directors of the Anchors Programs. Emily Loeks, Marc Rosenthal, Jackie Silhanek and Ron Van Timmeren are also serving as statewide committee members. With a focus on maximizing the quality of life for every child in its care, Jo Elyn Nyman Anchors Programs for Children is privileged to offer a wide range of pediatric services to families throughout Michigan. The Anchors Programs for Children, funded through a generous gift from the Samuel & Jean Frankel Foundation, includes Compass Support Services, The James B. Fahner MD Pediatric Hospice Program and The Anchors Perinatal Program. For more, visit https://www.hom.org/our-services/anchors-pediatric-programs/. Adapted from the 1981 children’s book written and illustrated by Caldecott author Chris Van Allsburg, Jumanji: Welcome to the Jungle, A Sony Pictures Production is directed by Michigan native Jake Kasdan and stars Dwayne “The Rock” Johnson, Jack Black, Kevin Hart, Nick Jonas and Karen Gillan.